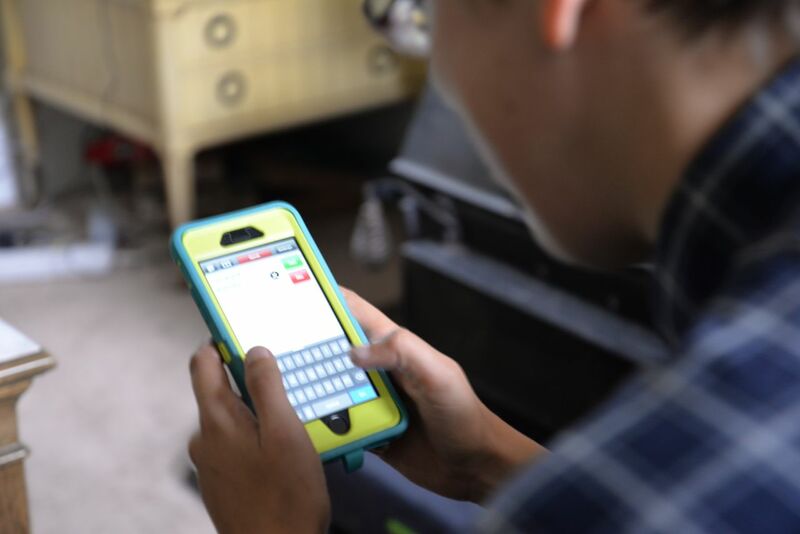 From smart phones and smart homes to tablets and touch screens, the technology wave has hit just about every aspect of daily life; except, that is, the daily lives of people with Intellectual/Developmental Disabilities, where the tech wave has looked more like a tech trickle. The problem extends beyond a lack of resources to buy the devices or software; it includes the need for services to evaluate an individual’s specific needs, identify and adapt devices, and provide training. It’s the coordination of these resources that turns a device into a virtual ramp to the world instead of gathering dust on a shelf. Sherwood Community Services in Lake Stevens knows first hand the rewards and hard work of putting all the pieces of the technology puzzle together. 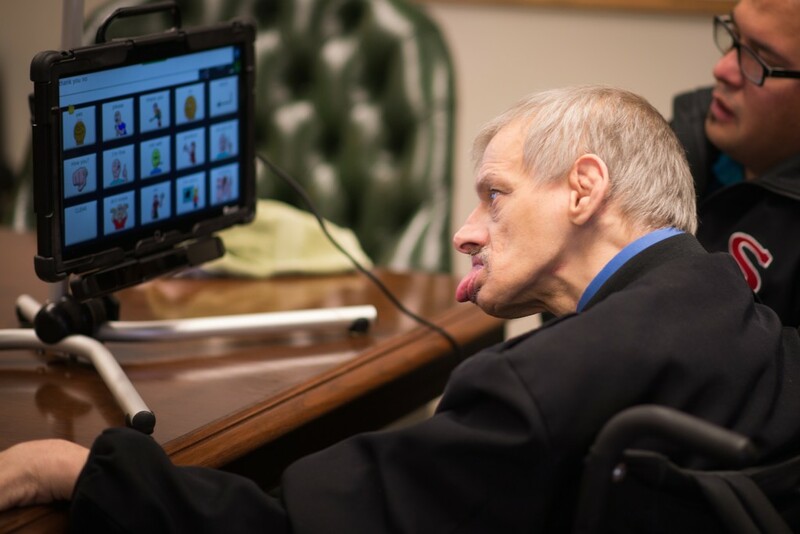 Through its Assistive Technology Services program, Sherwood helps children and adults with I/DD access readily available technology, adapting it to work for each person’s individual needs. He stared at a box of Kleenex, put his head down, and looked back at the box of tissues. Urie said they knew then and there that Ron needed a communication device so that he could use his own words to tell people what he was feeling. When Sherwood’s team asked Ron how he communicates his feelings, his staff pointed to the book. Urie said they asked him again, and Ron looked around the room. He stared at a box of Kleenex, put his head down, and looked back at the box of tissues. Urie said they knew then and there that Ron needed a communication device so that he could use his own words to tell people what he was feeling. Over a three-month period of trial and error, including having Ron participate in one of Sherwood’s Communication Groups, they decided to reach out to Prentke Romich & Company (PRC) and setup a consultation with their local representative to evaluate the use of an eye tracking system. The team worked with PRC and Ron’s home support staff to obtain an Accent 1400 communication device and a NuEyeTracking System. The whole process took nearly 6 months from start to finish. Sherwood’s Assistive Technology Services has been so successful, and the need so great, that they’ve begun helping individuals and families throughout the state to tap into resources for purchasing a variety of devices to meet individual needs through their Supplies and Equipment Services (SES) program. Community First Choice (CFC), a new state plan that includes personal care services, comes with an assistive technology benefit of $500 per year. Sherwood is the first to step up and contract with the state to help people on CFC purchase devices, such as refurbished iPads. Medicaid Waivers are another source of AT benefits. Morehouse estimates that about 13,000 people on CFC could potentially qualify for the assistive technology benefit. The challenge, he points out, is that CFC only covers the cost of the device, and not the services needed to adapt the device and/or train the individual and their family/staff how to use it. Assistive Technology Services can, however, help people identify resources to pay for those services, such as private insurance, DDA’s Individual & Family Services and CIIBS Medicaid waivers, or school. To learn more about Assistive Technology Services, email Andrew Urie or call (425) 404-3111. Contracted with the Developmental Disabilities Administration (DDA) to provide Supplies and Equipment to eligible individuals. If you’re unsure if you qualify contact your case resource manager at DDA and ask about this service. Therapy and Assistive Technology Clinic Serving King and Snohomish Counties.